Polar Pioneer is the same length as Sydney's Manly Ferry yet it expertly handles some of the world's roughest waters -- crossing the Drake Passage to Antarctica and navigating the Arctic. It might not be young or luxurious, but what's a more reassuring polar vehicle than a robust icebreaker with a clean 36-year track record and the same master (Captain Sasha) since 2001? Built in 1982 for the Soviet research fleet as the Akademik Shuleykin, the ship was refurbished and renamed Polar Pioneer in 2000 when it began summer operations with Aurora Expeditions. As one of the oldest ships still used for tourism, it's a floating museum of maritime history. The PA system looks like a salvaged piece of wartime equipment, the crew communicate using rotary-dial telephones and the walls are lined with black-and-white reprints of iconic images by Antarctic photographer Frank Hurley. For many passengers, these features enhance the ship's charm and authenticity, while others may find it old and dated. Another great perk is the open bridge policy so passengers can observe the nimble navigation through iceberg-clogged channels and watch whales and seabirds from the comfort of this warm room. The bow and uppermost decks are also accessible, providing superb vantage points for photography or gazing wistfully at the majestic landscapes and wildlife passing by. In some ways, this former Soviet research vessel is not ideal for recreational cruising. Cabins can feel cramped and those on Deck 3 have no ensuite bathrooms. Although it's such a small ship that the shared facilities may actually be closer to your cabin -- and more regularly cleaned -- than the bathroom and bedroom in your own home. For anyone taller than six feet, the single beds and low ceilings are an issue. 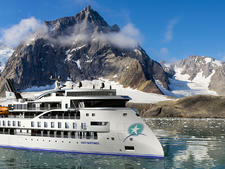 Polar Pioneer is a sound choice for travellers who favour functionality and safety over luxury, who thrive in the company of likeminded people, and who want to feel like they're on a real adventure on a hardy little ship. Aurora Expeditions attracts mostly Australians, as well as a small number of New Zealanders, British, European, American and Asian. The more active itineraries with mountaineering and skiing see a younger age group as well as fit retirees. Our Antarctic voyage had 10 solo travellers and 20 couples aged in their 30s through to 70s. Adventure gear is worn all day and most evenings, including in the bar and dining room. Waterproof pants, thermals, gloves, beanies, scarves, sunglasses or snow goggles are essential. A waterproof backpack and your own refillable water bottle are also useful. Gumboots and polar jackets are provided onboard (you can keep the jacket). Passengers may like to dress up for the welcome or farewell drinks but most don't bother. Fares include all meals, shore excursions, welcome and farewell drinks, basic healthcare services by the ship's doctor, an expedition jacket, and self-serve tea, coffee, biscuits and filtered water. In Antarctica, a night of camping on the ice (weather permitting) is complimentary. Gratuities are not expected but tips for the Russian crew, chefs and hotel managers can be left in U.S. dollars cash in a box placed on the bar ($10 per passenger per day is recommended but not compulsory). For all other purchases, such as drinks and laundry, the onboard currency is Australian dollars. Shortly after returning home, passengers will receive a hardback logbook featuring photos and summaries of the voyage.